Your experienced pilot guide will make sure that every moment of this life-changing adventure is filled with thrilling sights as you glide over wild, untamed rivers and climb through huge U-shaped valleys to trace the spine of the Alaska Range—the home of Denali (formerly Mt. McKinley). 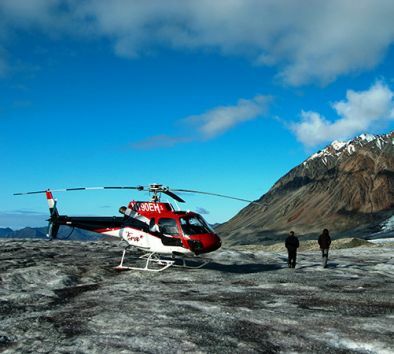 Revel in the sweeping bird’s-eye views and land on the Yanert Glacier to see astounding natural wonders up close. You’ll join your pilot guide to explore dramatic icefalls, moraines, mystifying ice bridges and icy-blue glacial pools. Bring your camera to capture each new experience to share with family and friends! As you step back on board the helicopter, you’ll return through pristine habitat watching for treasured sightings of bears, moose and Dall sheep. On very clear days, you may catch a glimpse of Denali (formerly Mt. McKinley) making this tour an adventure beyond compare! Minimum age is 2. Bags, purses, loose items or tablets will not be allowed on board the helicopter. Due to changing weather patterns, it may be necessary to alter the flight path. Bring a jacket, sunglasses and a camera. Glacier walking boots will be provided. Flight time is approximately 50 minutes with 15-20 minutes on the glacier.